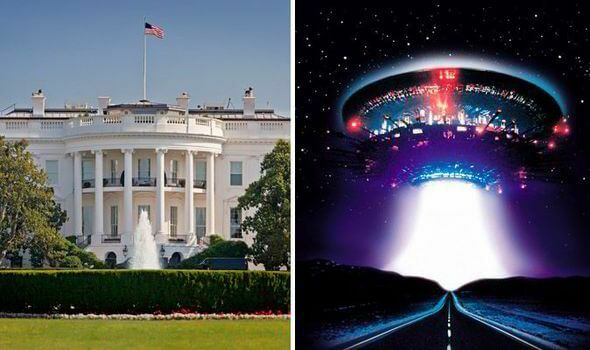 Home » UFOs over the White House: Do the US presidents know about the existence of aliens? UFOs over the White House: Do the US presidents know about the existence of aliens? Headquarters has come to the determination that the mystery airplanes are in fact not earthly and according to secret intelligence sources that are in all probability of interplanetary origin,” wrote US Army chief of staff general George C Marshall to president Franklin D Roosevelt in March 1942, according to a recently leaked memo.President Roosevelt replied urging the “finding of practical uses for the atomic secrets learned from the study of celestial devices”.And in another memo Roosevelt wrote of “coming to grips with the reality that our planet is not the only one harbouring intelligent life in the universe”. He added: “We will take every advantage of such wonders that have come to us.”The secret memos, whose authenticity is fiercely debated, are part of a mountain of evidence uncovered by the new book’s author Larry Holcombe. “UFOs exist and extraterrestrial life has visited Earth,” says Holcombe, 71. Millions have long suspected that not all UFOs could be explained away as experimental aircraft and weather balloons. The US’s Area 51 Air Force base in Nevada is rumoured to hide alien corpses and their spaceships as depicted in movie Independence Day. Many believe there is a secret President’s book handed to each new incumbent of the Oval Office revealing the existence of aliens, just like the one in the film National Treasure 2. The US even seems to be moving towards publicly acknowledging the existence of alien life. Nasa has restructured its research to look for other solar systems, emerging worlds and alien life.And the space agency’s chief scientist Dr Ellen Stofan recently said that she believes “strong indications” of extraterrestrial life will be discovered within a decade.Holcombe says that two past US presidents claimed to have had close encounters with aliens and that Ronald Reagan had two encounters and even became president thanks to advice from an extra terrestrial.Actresses Lucille Ball and Shirley MacLaine, who partied with actor Reagan on the night of his first alien encounter, claimed that the future president insisted that his road to the party had been initially blocked by a UFO.An alien came up to his car and told him: “Leave acting and go into politics.”Later, as governor of California in 1974, Reagan saw a strange moving light from the window of his private jet and ordered his pilot to follow it.“To our utter amazement it went straight up into the heavens,” Reagan is said to have recalled.Reagan even spoke of a possible alien invasion in 1987, adding: “I ask, is not an alien force already among us?”Before becoming president Jimmy Carter is said to have witnessed a bright green light in the sky fly towards him in 1969. It changed colour to blue, then red, then white before racing away. “It didn’t have any solid substance to it,” said a mystified Carter, who filed a UFO report. But all presidents were given ample evidence of the existence of extraterrestrial life and told to keep it secret rather than scare an anxious public, claims the book. President Harry S Truman drew a veil of secrecy over the 1947 alien spaceship crash near Roswell, New Mexico, and the alleged crash of a second alien craft almost simultaneously about 140 miles away on the San Agustin Plains. Truman had supposedly created the “Majestic 12” in 1942: a secret committee of scientists and military to cover up extraterrestrial activities. Late in the Second World War Dwight D Eisenhower met with Winston Churchill to discuss an RAF reconnaissance aircraft’s close encounter with a UFO near the English coastline. Churchill reportedly told Eisenhower: “This event should be immediately classified as it would create mass panic amongst the general population and destroy one’s belief in the Church.”When president, Eisenhower is even rumoured to have had a summit meeting with aliens.”It’s veiled in secrecy but a number of reliable sources claim that he flew to Holloman Air Force Base in New Mexico to meet with extraterrestrials in 1955,” says Holcombe.Presidents hid possible alien encounters from Americans after the war but as the CIA grew in power it took over alien investigations and cover-ups, claims the author.“There’s been a government coverup but since the 1960s there’s been a cover-up to keep presidents in the dark as well,” says Holcombe.“Extraterrestrial investigations in the US are controlled by a powerful and secretive scientific and military-intelligence committee answerable to no one.“President John F Kennedy demanded that the CIA hand over secret files and every president since has wished he knew more.“President Bill Clinton has said he tried to get UFO information and it was withheld from him.“Kennedy’s pushing for UFO information may have been behind his assassination in 1963. President Richard Nixon authorised a UFO documentary using secret footage of an alien craft landing during his re-election campaign in 1972 but the project was axed by intelligence chiefs, claims Holcombe. “Nixon believed that a limited level of UFO disclosure would ensure his place in history,” he adds. While running for office Gerald Ford, Carter and Clinton all demanded government openness about UFOs but fell silent once elected to the White House and privy to alien secrets. Holcombe says he found evidence suggesting that several alien bodies have been studied by the US military and alien technologies copied. Yet despite recent calls for greater openness about UFO encounters he says: “I don’t think Britain or the US is going to admit that alien life has been visiting Earth for some time. “But they may be forced to admit it if extraterrestrials make their presence known. “Many laws have been broken to keep this secret. “It’s been the greatest cover-up in the history of mankind.